81% say high cost is the number one reason they don’t have an advertising agency or PR firm on retainer. 89% that used an advertising agency felt overcharged and underappreciated. 83% listed “increasing sales through more effective advertising and marketing” as their number one priority. There are more than 22 million small businesses in the United States and roughly 900,000 new startups each year. As a Firespring franchise owner, you will be uniquely positioned to serve the needs of a largely untapped $45 billion market—one that has been underserved and grossly overcharged by traditional advertising agencies. When you include nonprofit organizations, institutions, entrepreneurs and small office/home office professionals, Firespring provides the opportunity to build a diverse and dependable client base in hundreds of markets nationwide. Firespring offers a broad menu of marketing services and website solutions far beyond that of our competition. As you build lasting relationships with clients, you’ll develop an expanding stream of recurring revenue in addition to fees collected at the point of sale. This dependable revenue will enable you to build sustainable value and grow your franchise operation as you see fit to meet the growing demands of your market. We will help you develop long-term relationships with professional clients. Our proven sales and marketing systems will help you attract and retain desirable clients that embrace the value and impact of a consistent brand message. And, as a business-to-business provider, you will not be required to operate on evenings or weekends. When you open your own Firespring franchise, you’ll enjoy the benefits of being in business for yourself. By taking charge of your schedule and lifestyle, you will be free from corporate travel, relocation and downsizing, allowing you to spend more time with your family. As your client base grows, you will have the freedom to expand your operation to meet your specific business objectives. We will help you target qualified prospects, attract them through concentrated promotional efforts and retain their business using proven crm strategies. Your sales coach will work with you to develop a plan to meet your specific objectives and keep you motivated while a dedicated marketing specialist will provide product support and industry-specific expertise to help you serve your clients. 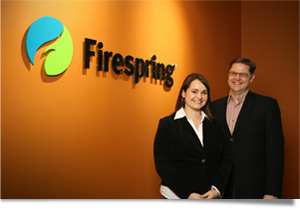 With over 3,000 clients on five continents, Firespring has built a strong reputation as a marketing expert and website technology innovator in the small business and nonprofit markets. As we have discovered, satisfied clients often lead to new business opportunities. As you build your client base, new prospects will arrive by way of referral from those that already rely on Firespring to solve their marketing challenges. In addition, we offer regular, free seminars and workshops throughout North America intended to show how small businesses and organizations can leverage their marketing to strengthen customer relationships and grow their operation. Firespring has been a pioneer in the web development field since the mid 1990s. As a franchise owner, you will have access to a suite of predeveloped, industry-specific solutions, an unrivaled proprietary development platform and a highly skilled team of veteran designers and programmers that can handle virtually any client request. We constantly research and evaluate emerging technologies and development trends to maintain an advantage over our competitors. This enables us to respond to new opportunities quickly to ensure that our clients always have the latest tools at their fingertips. The success of any small business or organization depends on effective communications. Firespring combines strategic elements of branding and marketing to establish a consistent message that delivers measurable results. Designed to accommodate the budget limitations and unique market challenges your clients face, our marketing plans range from select components to a fully integrated approach incorporating several channels. We support, advise and train your clients well after their solutions are set in motion. Our support services team works extended shifts to provide one-to-one assistance across five continents. We also offer an ever-growing online knowledge database and extensive training programs designed to help your clients leverage their marketing and website investments for maximum impact.